Home | Vinyl Siding Colors | Insulated Vinyl Siding: Right for You? Insulated Vinyl Siding: Right for You? If you've ever felt cold air coming out of your electrical outlets in the wintertime, you know your home's insulation may be lacking. When you take steps to correct drafts and insulation deficiencies, your home is far more comfortable and heating costs decrease significantly. A big step in the right direction may be installing new insulated vinyl siding. In the past, experienced vinyl siding contractors would install backing boards on a home before they mounted the vinyl siding. Backing board was usually 3/8-inch thick and secured to the exterior sheathing in sheets. This preliminary step sealed gaps and created a good base for the siding. The siding was then nailed through the backing board and into the framing members. This gave the home a fairly inexpensive insulation benefit. Siding manufacturers have made some advancements since the days of using backing boards. Many newer types of vinyl siding are available with insulated backing pre-formed in the shape of the siding. Some options have the backing already attached to the siding panels, and some feature two separate pieces. With both of these innovative new options, the shape and feel of the insulated backing and vinyl siding panels are much more solid and stable when attached to a home. The insulation value is far better than older models. Additionally, today's insulated vinyl siding does not warp or become wavy. When installed correctly, it remains firmly in place and keeps its shape. There are many attractive styles and colors available, for every type of structure. The new generation of insulated vinyl siding can help lower your energy costs and greatly improve the appearance of your home. 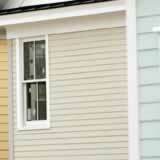 Vinyl siding colors: what works best? Vinyl siding colors: can metal siding compete? House siding colors: What is traditional?